In the last two days I've worn outfits that were completely opposite. One colourful, one black/white. One floral, one spectacles. One a dress and one....a dress. Ok, so they aren't totally opposite. I added this obi belt on a whim to cover the elastic waist and I think it actually goes quite well. It adds a little visual interest. I bought this cardigan at Target on the weekend to replace my "workhorse" red cardigan that is on its last legs. I think it will do well. And blue hose and green shoes? Unexpected? One of my coworkers said that this is her favourite outfit of mine so far. On my walk home it was a bit windy. And this skirt is pretty short. I may have flashed people on my walk down Queen Street. Today? Not as colourful but still with the mixing of patterns. I bought this polka dot cardigan to replace this one that is on its last legs. It would seem that I'm hard on cardigans. A woman stopped me on the street to tell me that she liked my dress. I love it when that happens. :) Who doesn't like a little validation in life? Ooh! A great unexpected use of that obi belt. Also love the green shoes. T strap and a cute little wooden heel = a great shoe! 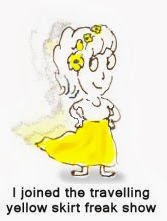 I've turned into that person who stops people on the street! Ditto on the green shoes and the obi - nice accents! And I love the spectacular dress with the dotty cardigan. It's so hard to replace "old faithful" pieces in the wardrobe - nicely done with yours! I love the green shoes, and the obi, and of course, that dress is a spectacle (har!). Those are great outfits. The belt in the first one is super and black and white is always right. You also always look perfectly put together. I have an arsenal of cardigans that I try to replace regularly - when you work in an air-conditioned office they are a girl's best friend. Like the mixing of green, blue and orange - happy colours! I always stop people on the street who are wearing things I admire, even if I'm not going to photograph them for my blog. It's amazing the effect a compliment can have on someone's day. It's your shoes, girl. I always love your shoes. But I am dying to see what you and your great outfits look like in natural light! I really like both outfits - the brightly coloured dress with the blue tights and green shoes is just lovely. 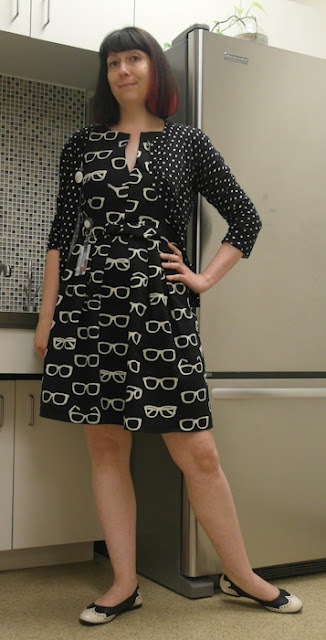 I adore the glasses dress, maybe because I wear glasses myself. I just read your last few posts and you have a truly amazing selection of shoes and how cool to meet Mr Fluvog!! Cardigans are an essential part of my wardrobe too - they are so versatile. 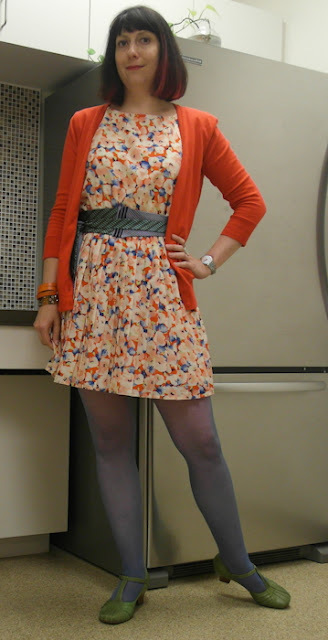 lovely floral dress and fabulous color combo, that tights and shoes contrast is awesome!, glad you find an adequate cardigan!, and also love that b&w outfit, that dress is really pretty, such a beautiful print! You are equally gorgeous in colour and black-and-white! No wonder you rake in the compliments and get stopped in the street - such excellent combinations. 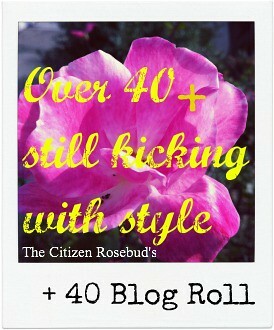 I just found your blog via Ephemera...I think I have a girl-crush (as I do with Sheila!)! 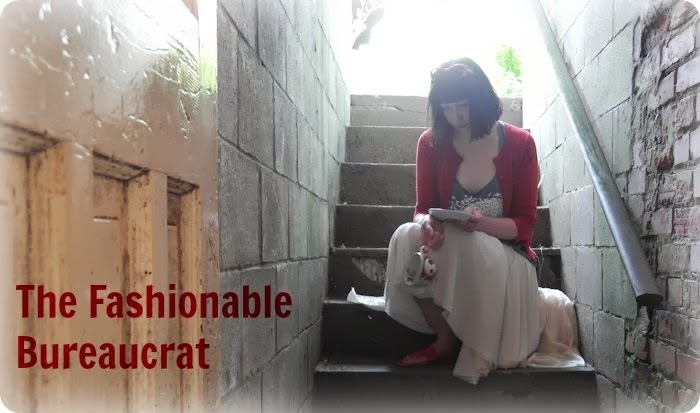 Your fashion esthetic is so similar to mine - tights, flats, boots, skulls, Fluevogs, and all! I am really enjoying scrolling through your posts. Thanks for being here! I love that spectacles dress! LOVE IT! The shoes in the June 10th post are outrageously wonderful. I love green, so I must have them.